In his essay collection “This Is Only a Test,” B.J. Hollars is buffeted on one side by terrifying cataclysms and on the other by typical new-parent anxiety. These forces converge spectacularly in the opener, “Goodbye, Tuscaloosa,” where Hollars describes huddling in a bathtub with his wife and their dog as a violent EF4 tornado begins tearing apart their neighborhood. She has just learned that she is pregnant with their first child. They survive, but Hollars is not unscathed. “I have been trying to write my way out of disaster,” Hollars writes, playing a note he will sound again in this book. An assistant professor of English at the University of Wisconsin-Eau Claire, Hollars is becoming a laureate of disaster writing. One of his earlier books, “Dispatches From the Drownings: Reporting the Fiction of Nonfiction” (University of New Mexico Press), mixed rewritten version of news articles about drownings in the Eau Claire area between 1875 and 1922 with some completely fictional accounts. The conceptually challenging “Dispatches” reflects Hollars’ strong interest in pushing nonfiction forms as far as he can. 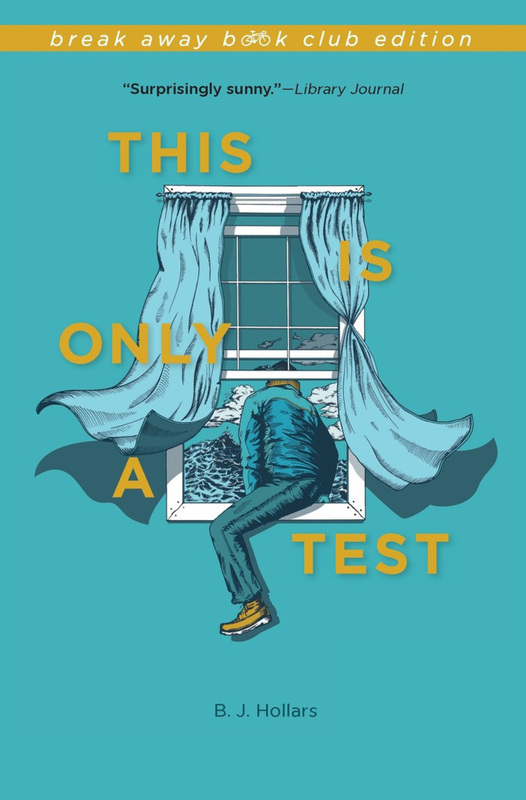 While “This Is Only a Test” mixes memoir, storytelling and research in a way that can be labeled creative nonfiction, Hollars writes in an accessible, personable voice. A high school student could read this book, and appreciate much of it. Hollars’ anxiety is an uneasy form of awe: He is humbled by the power of tornadoes, earthquakes and swiftly flowing rivers, especially when compared to the frailty of human beings. “Perhaps our lack of understanding isn’t due to the scientific uncertainty of the phenomena, but our inability to fit tornadoes into a moral framework,” he wonders in “Fifty Ways of Looking at Tornadoes.” Many of his essays incorporate factual nuggets on tornadoes, drownings and suchlike. He’s an intellectual Mithridates, trying to inoculate himself against harm by swallowing little bits of the poison. Hollars has a few minutes of media celebrity after writing a public letter to the people of Joplin, Mo., in the aftermath of their horrific tornado. This leads him to question, in “The Girl in the Surf,’ what role writers and photographers should play as witnesses after these disasters. He concludes, I think, a la Ecclesiastes that there is a time to speak and a time to remain silent. For me this collection peaks in “Buckethead.” It begins as a camp tale of a boy hiding in a disused refrigerator, which leads to a shocking death. This turns out to be a cautionary tale Hollars heard as a camper and then told a counselor, perhaps not literally true but archetypally truthy. Hollars puts an unexpected narrative sting in the ending — a cautionary tale about telling such cautionary tales. Under all that, “Buckethead” reflects a core parental anxiety, the fear that your child will make one impulsive rash decision that will lead to a horrifying death. From a writer obsessed with tales of drowning, “The Changing” is a sweet and unexpected change-up. To impress the woman who would later become his wife, camp counselor Hollars volunteers to work in the Med Shed, where he struggles with changing the diaper of an immobile, possibly paralyzed, teenage boy. Later, on a hot day, Hollars and a lifeguard help the boy into the lake to enjoy the cooling water, where for safety’s sake Hollars must hold him as close as he can hold a person. In “Fort Wayne Is Still Seventh on Hitler’s List,” Hollars explores how trepidation grew in his Indiana hometown in the 1940s, after Pearl Harbor, about the possibility of attack from German bombers. He revisits civil defense materials from the era, including the script of an instructional film, “Bombs Over Fort Wayne,” which models how preparedness can help save a plucky industrial burg. Of course, it seems ridiculous today to think that the Luftwaffe could have flown all the way to Indiana unscathed. But how many of us, after the terrorist attacks of Sept. 11, saw or heard a plane overhead and trembled for a moment?